Since arriving at Ashley Farm CL my morning walk has provided distant views of the Black Mountains, so far it has been too hot to contemplate walking up them but the forecast for today is a bit cooler. It looks like the perfect day for a climb. 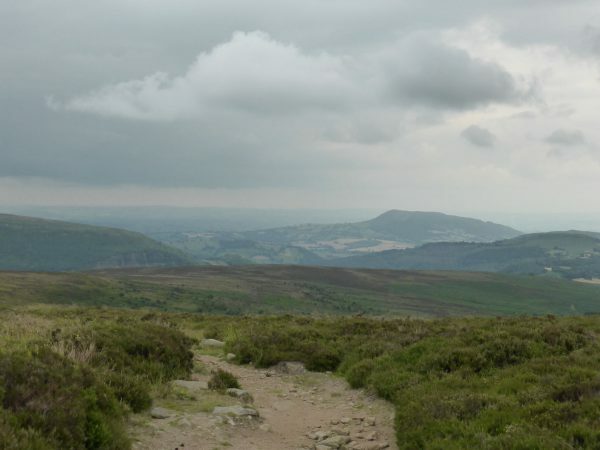 The starting point for our walk is Llanthony, we foolishly allow the sat nav to try and take us there, try being the operative word because we find ourselves in a farm track and whilst the sat nav tells us to continue straight ahead it is clear there is no road. We decide that the old fashioned method of looking at a map is the better option. Eventually arriving at Llanthony we park in the car park close to the remains of Llanthony Priory, this looks an interesting spot but we decide to walk before visiting the priory. We leave the car park and head down the road and cross over to take a footpath that leads over a footbridge. Then there is a network of paths, we take the one towards Bal-Bach. On entering a field we start to go uphill and after crossing a stile the route continues upwards. 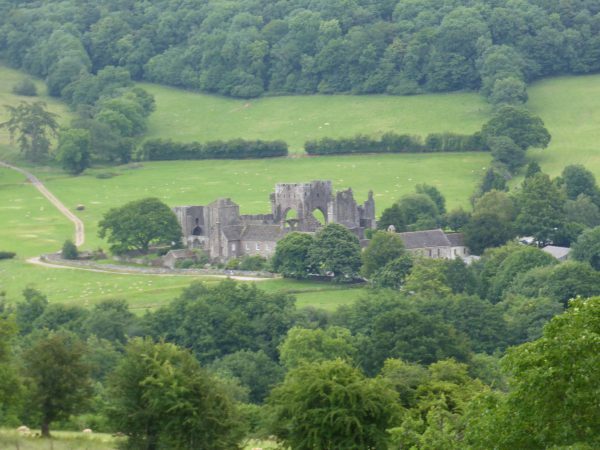 We are besides Cwm Bwchel and there are great views back over Llanthony Priory. In the valley to our right Lynnie spots a small, isolated clump of Himalayan Balsam and makes a note to contact the park authorities to alert them to the presence of this invasive plant. We pass a few groups of young walkers, who appear to be navigating their way around as part of their Duke of Edinburgh award. It is good to see youngsters out walking the countryside, although not all of them appear to be enjoying it! 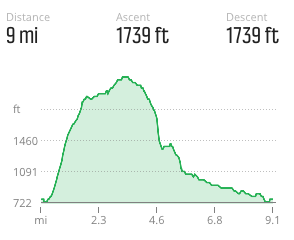 We continue uphill toward Bal-Bach and at a junction of paths turn right to Bal-Mawr. The summit of which, stands at 1992 feet and from here we get stunning views all around. The trig point marking the summit has a plaque saying that Roy of Wells adopted the pillar in 1994. 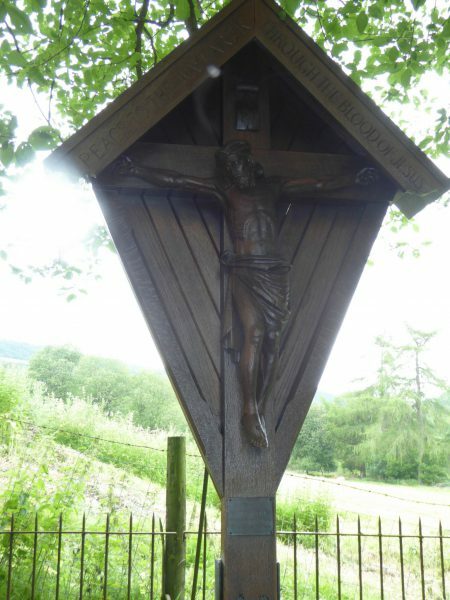 In 2013 it became redundant and the Ordnance Survey gave him custody along with his son Eric of Glastonbury. This is the first time I have heard of anyone adopting a trig point. Our route continues along the ridge and with a steady breeze we enjoy perfect walking conditions. It is weeks since we were last walking along hilltops, then we were in Nidderdale. The last few weeks have been really busy with work, Lynnie comments that the only time I appear relaxed is when we are walking with the phone switched off. I have reached that stage in life when I can choose to retire, albeit on a reduced pension, and I think the time has come to sign the forms! I don’t want to stop work; I just want to do less of it! We chat about what we might do if I reduce my work, we can hardly spend more time away than we do at the moment. But it would be more relaxing if we weren’t trying to fit work in with travel and it would allow us to keep up to date with our blogging. 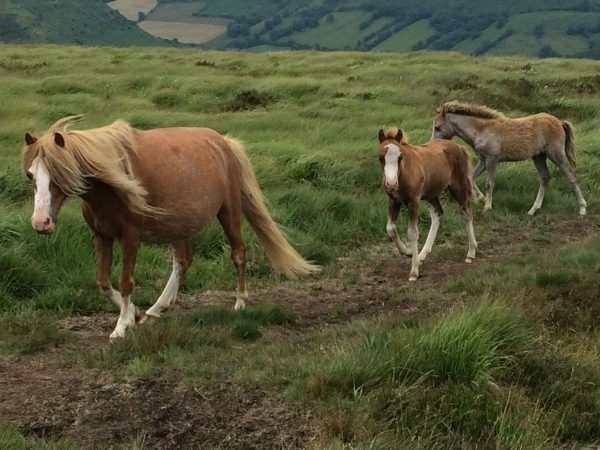 In the distance to our left we see Grwyne Fawr Reservoir, apart from a few horses we can’t see another living soul. This is my kind of walking! We reach the disused quarry at Chwarel y Fan and from here the Grwyne Fawr Reservoir is an impressive sight. This reservoir was completed in 1928, work started in 1912,but the out break of World War One stopped construction, which didn’t recommence until January 1919. A community of around 300 construction workers lived in the valley. The dam wall is 130 feet thick at the base. 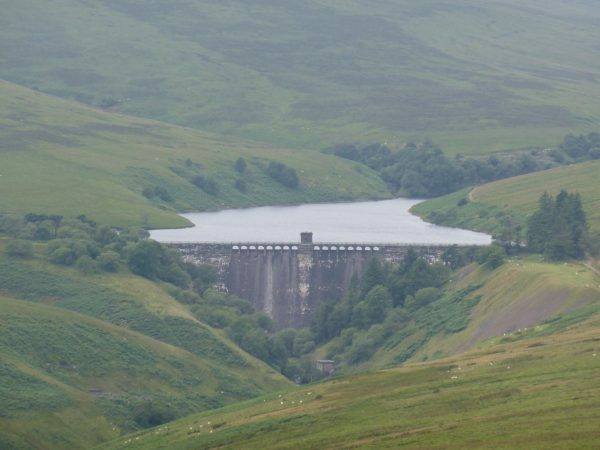 The site was chosen because at 1725 feet above sea level it was high enough to allow the water to be gravity fed to Abertillery and other local communities. We continue along the ridge until reaching a crossroads of paths amongst cairns, we turn right. Close by are ponies that are soon photographed by Lynnie. 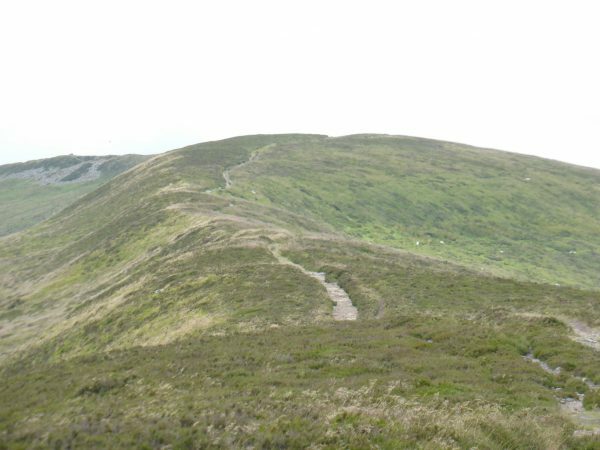 The clear path starts to descend across peaty moorland before becoming a rocky path as it descends ever more steeply into the valley. On the path is a young lamb, according to Lynnie this is a particularly pretty lamb. I make no comment! The path wends its way down the steep hillside and then flattens out as we walk towards Waun-goch where we double back on ourselves to The Grange this is a riding stables besides Capel-y-ffin Monastery. 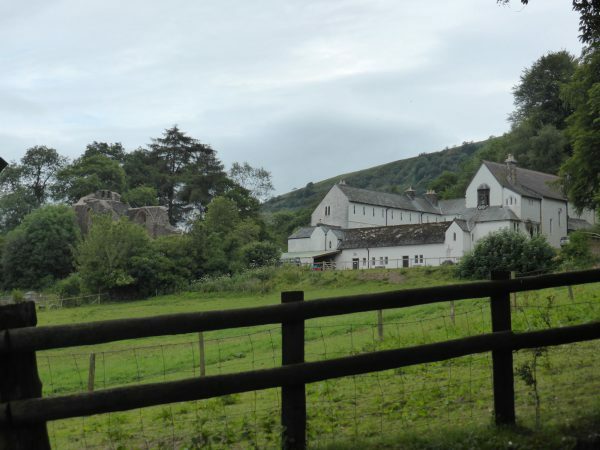 According to its website the monastery was built in 1870 by Father Ignatius to restore monastic life to the Church of England and was used as a monastery for over 40 years. In 1924 the monastery was bought by stone carver, engraver and typeface designer Eric Gill. It is now run as a bed and breakfast. Alongside the monastery are the ruins of an older monastery, but we could not see a way to access that site. Just down the driveway we stop and climb some steps to look at the monument to Father Ignatius, the plaque says his nieces erected this. On reaching the road we turn right and walk along the road, this is a quiet lane. 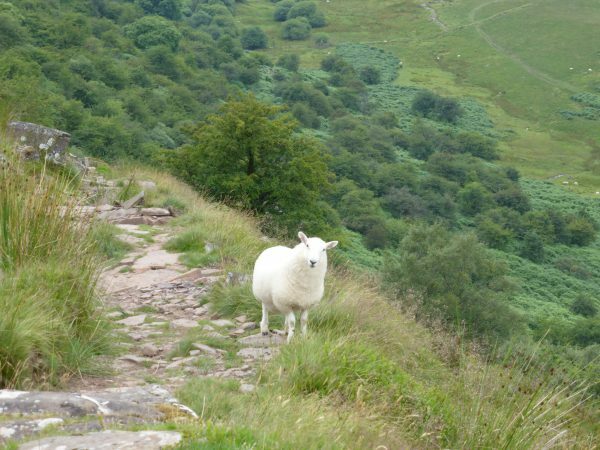 It was my original intention to climb the ridge on the far side and walk along it to Llanthony. However, it has been a warm afternoon and Lynnie does not look like she would welcome another climb. So we carry on following the road back towards our starting point. It is a road that is rarely used and it is easy walking with the very occasional car and a couple of tractors passing us. It is over three miles back to Llanthony and frequently Lynnie enquires how much further we have to go. 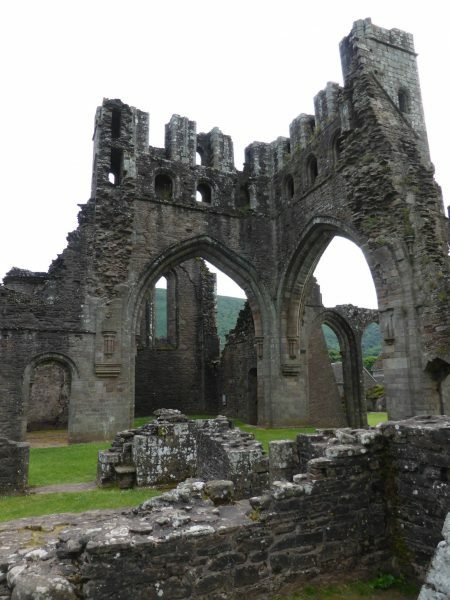 It takes us the best part of an hour to reach Llanthony and whilst I sort the boys out Lynnie goes for a wander around the ruins of the priory. The dogs are not allowed in the grounds. 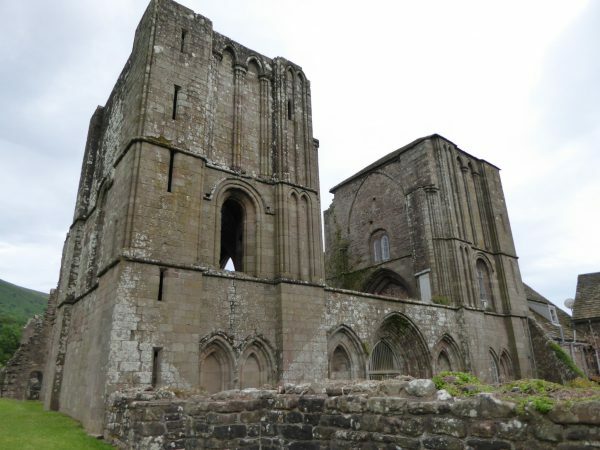 The priory is said to originally date from around 1118 when a group of forty Monks from England founded it. The locals did not take kindly to the incomers from over the border and they soon departed, but following funding from Hugh de Lacey in around 1186 and also from Pope Clement III building work continued and it was completed in 1217. It is a marvelous site with free access and on this warm summer evening very few people are about. 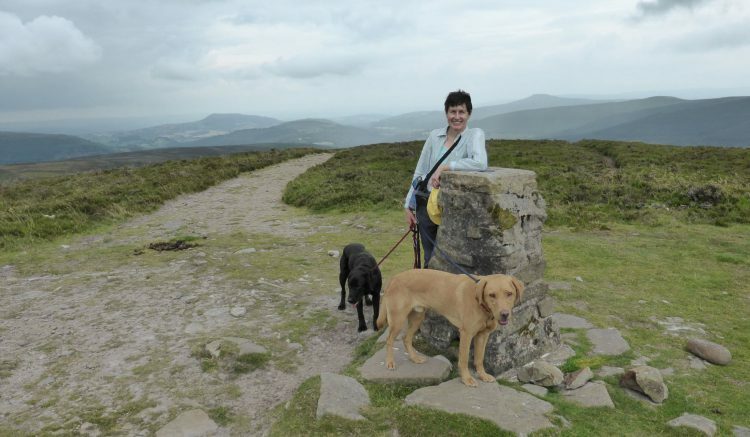 Our walk in the Black Mountains has given us an appetite for the area. It is stunning and we will be returning in the next few days. Today’s walk has covered just over nine miles and we are ready to get back to the Coachman for some well earned sustenance.